I thought by the name of it 'personal motifs' and the photo it was going to be a little risky but it is absolutely delightful and probably was a little racy for the time maybe not the motifs but the cover photo. I have book number 3 and as you look on the opening page there are eight to collect and so now I am on the hunt to see how many of them I can find. By the picture of the lady on the left this maybe a 1920's booklet because of the Marcel waves in her hair... although I am not totally sure. It was published by Clark & Co. Ltd in Paisley Scotland. I am thrilled with this for my collection and wanted to share this with you all so that you can see how really lovely this is. The series in this is as follows: Book 1 - Flowers Book 2 - Toy. Animals Book 3 - Birds ( which is what I have here) Book 4 - Sports Book 5 - Fruit and Flowers Book 6 - Animals Book 7 - Individual Interests and finally Book 8 - Popular Subjects. 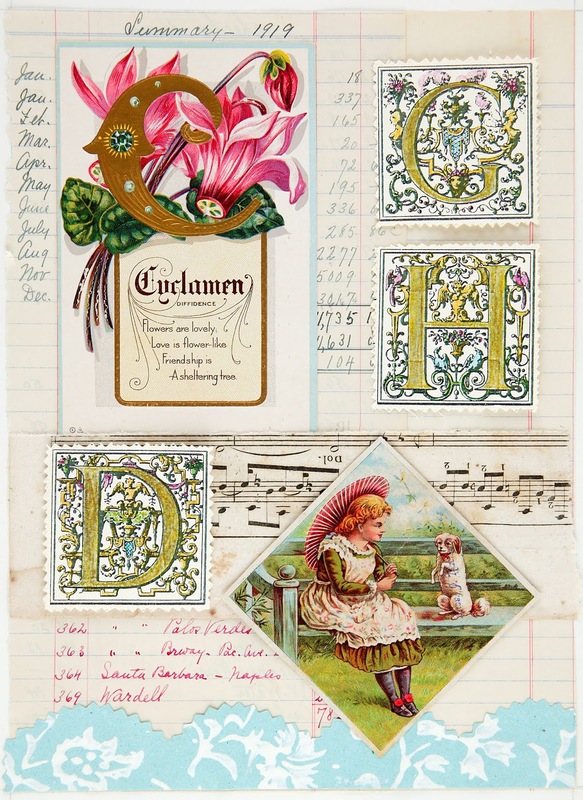 Then with the two pages of alphabets on the picture above they start to combine motifs to go with them and for my letter S there is a ballerina which must be in the pamphlet Book 7 - Individual Interests I would think. I adore this little book and now as I say I am on a treasure hunt for some more in this series. I will look on Ebay and at vintage fairs. I have made a list of them to carry in my purse and then it is always with me as to what it is I am looking for .... Book 3 has a tick by it! Anyway I hope you have enjoyed looking through this booklet with me and it has eased you all gently into Monday morning. Have a wonderful day and as always Happy Stitching! I am away to my stitching with ideas now bouncing around my head .. I can see I will have to have my notepad by me today. 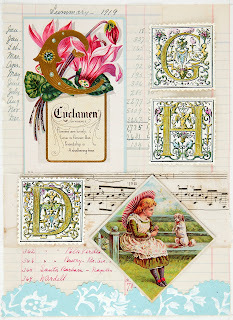 I love vintage transfers, using one at the moment. So do I Julie but something in me does not want to start tearing these out as it is in perfect condition! Silly isn't it?